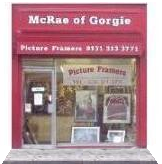 Established in 1989, McRae of Gorgie is a friendly and reliable family-run business. We have the experience and knowledge to deal with the endless possibilities of bespoke and contract framing and provide a great quality service at very competitive prices! All our framing is carried out on our premises and with so much attention to detail and pride of workmanship it's no surprise we have a proven record of customer satisfaction. Please have a browse to find out what we have to offer and feel free to contact us if you need any further information.